Hundreds of year ago, Gulliver was traveling the world and ended up in my little town. It was years before he ended up in Lilliput. Gulliver met the local people and saw how lovely this town was so he decided to stay hoping to get married and raise children here. He cut down some trees and built his house on this street. 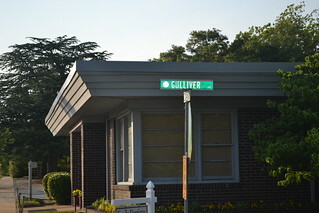 Since no one else lived there, everyone called it Gulliver St. Gulliver was a great neighbor but he got lonely because there was no one his age in town and he wanted to find a wife. So sadly, he decided that he needed to explore other places. So, he went down to Charleston and got on a ship but that ship is the one that wrecked and landed him in Lilliput.